We believe in transparency, so when companies report reviews that violate our guidelines, we ask them to state the reason(s) for reporting. When a company reports a review, a window appears asking them to explain the main reason(s) why they've chosen to report it. These explanations are public and visible to everyone in our community. 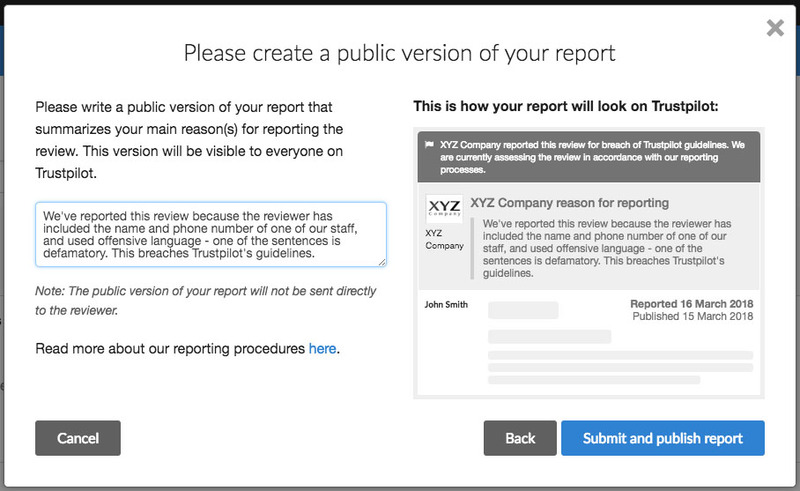 We include this step to make it clear why each review has been reported, and to help companies report reviews correctly. We believe that everyone should be able to see and understand who has reported each review and the reason(s) why. Without this explanation, users of our community will only be able to read that a review has been reported for breaching Trustpilot’s User Guidelines (US version, UK version). When we ask for more information from the company about why they have reported the review, people can see what the problem is. Violates another part of our guidelines. If companies or reviewers are not familiar with Trustpilot’s guidelines, this extra level of detail can help increase their awareness of the rules of our platform. Providing space for an explanation helps companies use our tools in a more open, honest and credible way. Asking them to state why each individual review has been reported provides them with an opportunity to show that they’ve taken the time to consider whether there is in fact a breach of our guidelines, and how. This extra level of openness also makes it less likely that members of our community will be mislead. It arms them with more insight into why a company reports reviews, and whether their reporting behaviour seems consistent and justified. Companies that report reviews correctly should find the reporting function a valuable tool that enhances business-consumer dialogue and transparency.